My amount of embellished sweatshirts have grown drastically over the past year. They are just as comfortable as any other sweatshirt in your closet, but they look so much cuter. If I had swapped this out for one of my college hoodies the entire outfit would have looked sloppier and like I had just rolled out of bed. The pattern and colors on this paired with a colored bag create a more cohesive look. Adding simple jewelry really takes the outfit up a notch as well. Stud earrings, a watch, and small necklace don't seem like they would make a big impact, but help this casual look to be more polished. How do you add polish to your weekend casual looks? I am on love with your sporty look Laura. You need to do outfits like these more often. That Plaid Sweatshirt is the cutest. Love the zipper detail. It is perfect to wear today for Plaidurday, too. HAVE A GREAT WEEKEND PRETTY MAMMA!! Your makeup looks amazing! I love the plaid sweatshirt and hat! love this relaxed look! have a great weekend, laura! Perfect weekend look! Love the ripped jeans. I need some more stylish sweatshirts like you are wearing here for my day to day attire! The plaid is so cute and I love the ball cap with it! Polished is right. I love how this look so casual but super chic too! This is a perfect weekend look or casual weekday look. I love cozy sweatshirts. Such a cute outfit! Perfect for the weekend! You look Marvelous! You have the best threadUp finds! This is such a cute weekend look! Love this casual look, Laura!! You look so cute in a hat and I love the plaid front on that sweatshirt. I love the baseball cap and ripped jeans! Perfect for a day off. I don't think I have any plaid sweatshirts and now I think I need to change that! Perfect fall weekend look! That is such a gorgeous sweatshirt! Sweatshirts are the most coziest thing ever so finding one that is also fashionable is a huge plus! How do I? Believe or not, I put up bright lipstick for weekends. You look very pretty in this sporty outfit! Love the jeans and sweatshirt! Have a great weekend! You're just so stinkin' cute! Adorable fun casual look, Laura! This look is so fun for the weekend! love it! So sporty chic! Love this! Such a fun top! Also love the jeans and the sunglasses! Very cute outfit for a weekend! Yes, I love it when comfort and style do not have to be mutually exclusive. 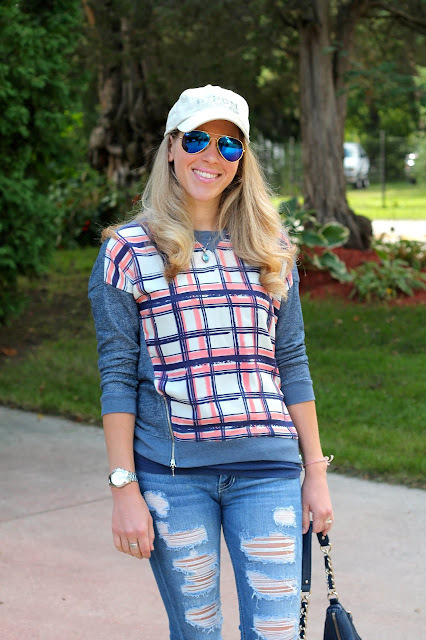 The ball cap and converse are the perfect casual style elements. Great casual look, Laura! Love the cute zipper detail on your shirt. As I was reading I realized I don't have any embellished sweatshirts. May just have to check out some for weekend wear.